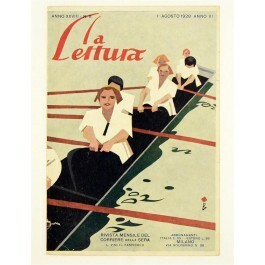 Poster realized in 1920 for the Transatlantica Italiana for the North Atlantic run. This is a fine poster of one of their flagships, the Cesare Battisti (named after its namesake , an Italian patriot €“ 1875-1916). In the left hand corner are listed six ocean going ships under construction at the time this poster was printed.